To commemorate this season’s production of Tolomeo, we suggest you pick up C. Steven LaRue’s Handel and His Singers: The Creation of the Royal Academy Operas, 1720–1728 (Clarendon Press, 1995). In this book, LaRue takes an in-depth look at the creative processes behind Handel’s operas, focusing on his time at the Royal Academy of Music in London. It is during this eight-year period that he produced many of his most enduring operas, including Floridante, Radamisto, Giulio Cesare, Tamerlano, Rodelinda, and the last opera he would write for the Academy, Tolomeo. The craze across Europe was for Italian opera, and it was Handel’s responsibility not only to compose works that would satisfy the demand for Italian-style opera seria, but also to contract the world-class singers that would perform them. LaRue’s book traces the relationships between composer, singer, and librettist, citing them as the determining factors in the creation of Handel’s most iconic characters. 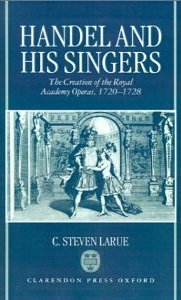 LaRue’s book is as much about the singers as it is about the roles they played on stage, and anyone interested in performance history will appreciate his survey of their careers at the Royal Academy. LaRue organizes his book primarily around these performers, with chapters on the prima donne such as Margherita Durastanti, who sang in both male and female roles, and another on the rivalry between Francesca Cuzzoni and Faustina Bordoni. He also tackles the legendary primo uomini, with a chapter dedicated to the tenor Francesco Borosini and his title role in Tamerlano. Likewise, much of the chapter on the world-renowned castrato, Senesino, deals with Handel’s writing of his role in Tolomeo. LaRue draws from a wide range of sources as historical evidence that Handel tailored each of his roles for individual performers, and these include original manuscripts, working librettos, correspondences and even contemporary reviews of performances. Even when employing relatively stock characters and themes, Handel still had to accommodate for details ranging from a singer’s vocal range to the kind of characters to which they were accustomed to playing to how a costume element would inform the nature of an aria or ensemble. LaRue reveals this process to be more fluid than one might think, however. He details how Handel’s original vision of a character often changed drastically as a response to an unexpected change of performer, using specific musical examples from the operas’ performance histories. For instance, the title role of Radamisto had been sung — first at its premier and again in two subsequent revivals — by three different performers (interestingly, these included two castrati and one female soprano), and each time Handel tailored the original music to fit the new singer’s voice. In another example, from Tolomeo, LaRue describes the transformation of Elisa’s seductive aria, “Se talor miri un fior,” originally from the rueful music we now know as Seleuce’s, “Fonti amichi, aure leggere.” In explaining these changes, LaRue points out the significance of where, when, and how their arias occur, and illustrates what each of these differences mean for the opera as a whole. LaRue’s textual and musical analyses of the operas from the vantage point of the singers offer a better understanding of the dramatic tools that Handel had at his disposal. With each singer came a personality and a style all its own, and LaRue’s book shows how all of those factors came together to create the operas by Handel we have come to know and love. 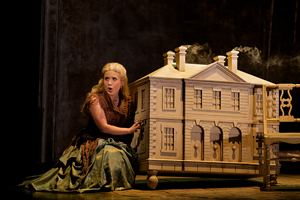 Joélle Harvey as Seleuce in Glimmerglass's "Tolomeo"